Mission organizers and police alike are mobilizing to address a spate of violence including shootings in the Mission and in Bernal Heights that have sent five victims to the hospital in the past two weeks, one of them a 13-year-old boy and one a man who was shot in June and died of his injuries on Oct. 3. 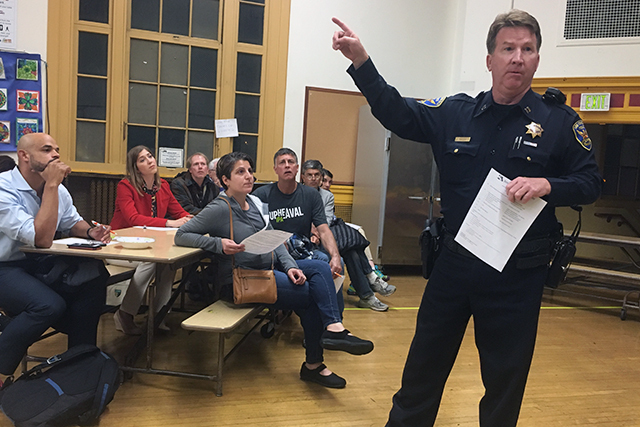 On Monday, representatives from San Francisco’s Gang Task Force Unit, police from Mission and Ingleside stations, as well as youth and violence prevention advocates met with community members at Leonard Flynn Elementary School to discuss their concerns. Addressing some 40 neighbors who filled the school’s cafeteria at 3132 Cesar Chavez Ave., Ingleside Police Captain Joseph MacFadden confirmed what most had already suspected – he attributed the shootings to conflicts among the Mission’s rivaling gangs, much of which is “carrying over” to Bernal Heights. “Most of these, they are not random,” said MacFadden, pointing to a list of shootings compiled by the neighbors that span an area from 23rd and Folsom streets, crossing Cesar Chavez Avenue and up to Precita Park, at Alabama and Precita streets. “It’s retaliatory,” he said, adding that a shooting that injured three in Precita Park is likely related to a shooting that erupted at the funeral proceedings of a man gunned down in June. The violence is not unique to their neighborhoods – gun violence is up citywide by 7 percent from last year, Interim Police Chief Toney Chaplin reported to the Police Commission last week. The spike mirrors increases in homicide rates in major cities nationwide. As the toll mounts locally, neighbors wanted to know what they could do. “The more active you get, the more phone calls you make – reporting to Nextdoor is not calling 911,” McFadden said. “Call when you see suspicious activity – the conduct, what’s going on,” adding that neighbors should be ready to give “head to toe descriptions” and descriptions of cars. But many said that they are already doing that, often calling multiple times and waiting hours for police to respond. Former Police Commissioner Jim Salinas, who was also in the crowd, blamed the recent spikes in violence to severe understaffing of the police department. “The reality is we don’t have enough cops in the city – we are about 400 cops short,” said Salinas. While neighbors demanded increased police presence, neighborhood violence prevention organizers working to figure out the motivations behind the violent sequence of events urged neighbors to call them before dialing 911. Prevention, they said, is key to stopping the flare-ups of violence – and several factors are emerging as root causes. Several organizers that said the perpetrators of recent shootings were reportedly young. Youth unemployment and a lack of educational and career opportunities for young disenfranchised residents, several said, are key to preventing street violence. “A lot of the crimes that young people here commit are crimes of poverty – theft, breaking into cars, because they don’t have means to purchase things on their own or aren’t given the opportunity to be able to do that,” said Roberto Alfaro, executive director of HOMEY, a nonprofit that focuses on youth development and violence prevention. May Chow, Director of Programs at the Central American Resource Center, a nonprofit that provides resources and legal services to low-income and immigrant communities, said that giving guidance along with jobs is key. “We ask the youth, what you do you want? They say, I need money, I need a job, I need papers,” she said. The need for employment can affect adults too. Carlos Gutierrez is an organizer with CALLES, a 36 year-old community-based street outreach program that does violence prevention or intervention work, and sometimes has volunteers to answer crisis calls. 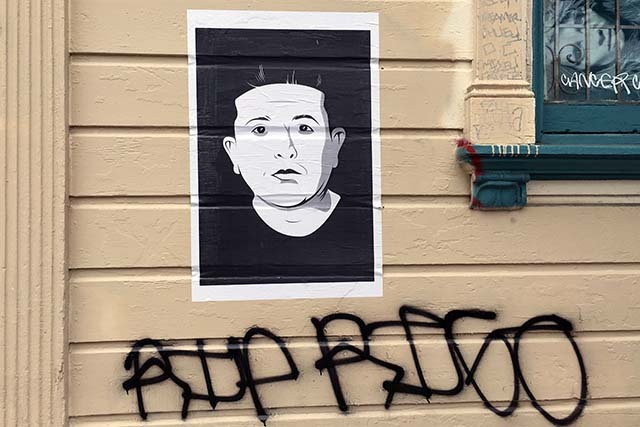 He said the CALLES team caught Fidel Amezcua, nicknamed “Happy,” as well as Rigoberto Romero, another resident of Shotwell Street, two weeks before the shootings that claimed both their lives. Gutierrez said both had asked about employment. Chow, who is from the Mission and a former gang member, said that retaliatory shootings create a cycle of violence that can terrorize – and traumatize – communities for decades. Family ties and friendships to gang members can make even those not involved in gang activity targets. 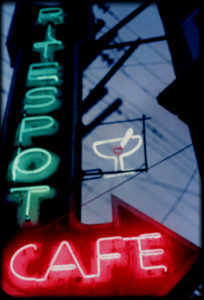 Such was the case with Romero, say his friends – the 27-year-old Shotwell Street resident was shot on his way to a liquor store located on 24th and Shotwell streets, a block away from his family home. A week before the June 1 incident, his friend Happy was shot on the same corner. It is unclear what gang ties, if any, the two men had. Mission Police Station Lieutenant Randy Caturay said on Monday that while most shootings are targeted, there are random casualties. “It’s called getting jumped in – they have to shoot a rival gangster or unfortunately commit some type of crime against citizens,” he explained. At Mission Station, Caturay said that resources to deter violence have been allocated to areas deemed gang hotspots. More foot patrols have been dispatched to the 24th Street corridor, and focus is placed on “on-the-spot” searches of parolees, he said. Still, many locals are fearful. “Being a Latino male in the Mission it feels like you just gotta watch your back now,” said Romero’s friend. Those actively working to get youth out of danger said that the violence is unlikely to stop unless social and economic inequities are addressed. Immigrant and working-class youth are particularly vulnerable to street violence, as parents are often working multiple jobs and have “no idea what their kids are going through,” said Chow. Some youth struggle with homelessness and a lack of support system at an early age – unaccompanied minors hailing from Central and South America are easy targets for recruitment by the Mission’s established gangs, explained Arturo Carrillo, director of the Street Violence Intervention Program, a city program that aims to reduce violence through intervention at the street level. Arturo and his team visit public schools to mediate conflicts and present youth with resources and alternatives to violence. “There are times when we say, ‘No, you are not going to get this guy today. What’s it going to take for you to calm down, think this through,’” he said. Such interventions are needed, he said, even among children in elementary schools. Higher education is also difficult to obtain – unlike a gun. An effective approach to the problem must be multifaceted, organizers said. One approach is providing “safe passage,” giving at-risk youth rides to somewhere off the street, where they might be in danger. Youth can also be targeted on their way to school or work. Roadmap to Peace, a community driven, five-year initiative that unites various service providers with school, parents, and police in providing wrap-around services – from drug rehabilitation to job training – to Latino youth between the ages of 13 and 24, is hailed as a long-term solution to addressing youth violence locally. The program is in its second year and also focuses on policy advocacy in an effort to address social, economic and educational inequities faced by at-risk youth. As for how others without expertise can get involved, Gutierrez recommended supporting shoestring-budget nonprofits like CALLES, Horizons, CARECEN and PODER that have experience working in the field. Laura Wenus contributed to this report. Take not that Supervisor Campos voted AGAINST increasing the number of police: http://www.sfexaminer.com/sf-supes-vote-6-5-to-boost-police-officers-beyond-charter-mandate/ so you can thank him for that. >While neighbors demanded increased police presence, neighborhood violence prevention >organizers working to figure out the motivations behind the violent sequence of events urged >neighbors to call them before dialing 911. Can you please clarify? You mention 5 shootings in 2 weeks and then mention a shooting in June as one of those. The message here is you are on your own. Do what you need to do to protect yourself.